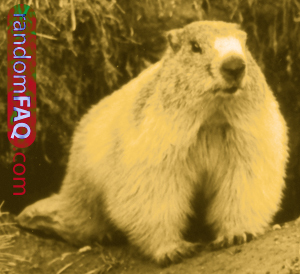 Contrary to the discovered "norm," marmots originated in the New World and migrated to Siberia and the Asian steppe. One of the reasons the groundhog is so trusted in terms of weather prediction in North America is because it is the most efficient hibernating animal. During its hibernation, the marmot goes below a certain depth in the ground to keep above the freezing point. They are able to shut down most of their bodily functions to a point that is a hair above death and/or total brain damage, safely. This has made science very interested in the marmot. In fact, because of its almost unnatural hibernation state, cardiologists used the animal as an inspiration for the first pacemaker. Other modern techniques for anesthetizing the human body have also come from marmot research. Competition is strong in the community. Mothers who are agreed upon as the most fit for procreation get impregnated. If other mothers become pregnant the original one will start altercations by scaring/fighting the new mother into a state of stillbirth from sheer shock. This is because of limited food resources.